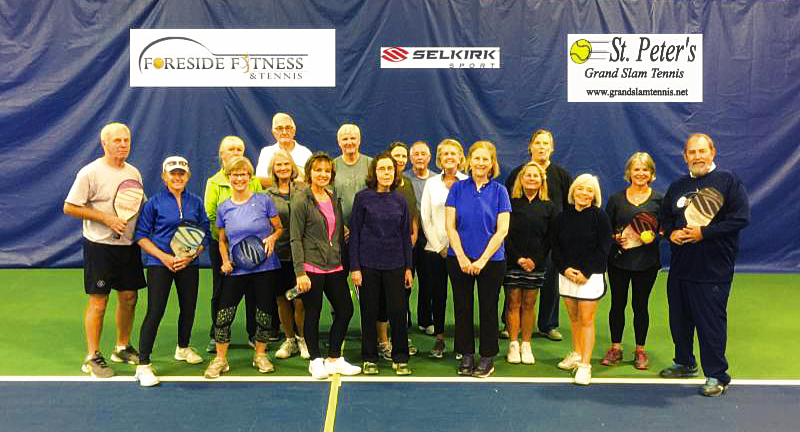 St.Peter’s Grand Slam Tennis and Foreside Fitness & Tennis are now introducing beginner and intermediate pickleball clinics. Pickleball is not just growing here, it is expanding across the entire globe. This competitive paddle sport is picking up speed for a number of reasons. It is known for its ease of learning and appeal to all ages. Anyone can play this sport! Whether they are looking for a fun game, healthy exercise or intense competition, pickleball has the ability to fulfill all of these desires. Pickleball players are known for their strong communal focus. And very little equipment is needed to play the game. How many more reasons do you need? Registration is required for all clinics…please contact Wayne St. Peter to sign up. We’re excited to announce that we are now carrying Pickleball paddles by Selkirk Sport, the leading high-performance Pickleball brand, in our pro shop at Foreside Fitness & Tennis! $72 per session ~ Registration required; please contact Wayne St. Peter.